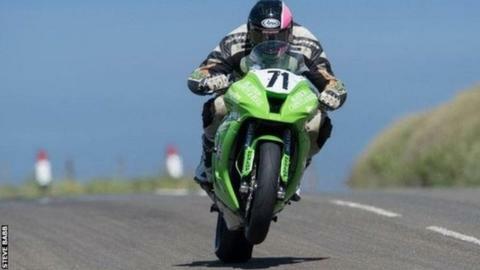 Tributes have been paid to Gateshead rider Davey Lambert by motorsport fans and teams after his death following a crash at the Isle of Man TT. Lambert, 48, came off his bike at Greeba Castle on Sunday, and died from his injuries. at Aintree Hospital in Liverpool on Tuesday. The family message on his Facebook page said: "He went out of this world in exactly the way he would have wanted. "He was a big man with an even bigger heart who will be sorely missed." Manx Motorcycle Club chairman Harvey Garton said on the club's fanpage: "Davey will be greatly missed in the paddock. He had made steady progress with his racing career at the Manx and we were delighted to see him progress to the TT and fulfil his dreams of competing on the world famous TT course." The Herbertson Racing team wrote on Facebook: "It is difficult to put into words how all the Team at Herbertson Racing are feeling, we have lost a great friend and a true gentle giant in Davey Lambert. "All our thoughts are with Tracey and the family at this extremely sad time. We will never forget Davey. "Dominic and Mark will miss Davey's race craft on the track. Libby, Samantha and Joanne will miss his humour and presence in the paddock. We will miss you - until we meet again."